Martin Luther King III is the son of one of the most famous — and most frequently referenced — men in our nation's history. His father Martin Luther King, Jr. is the defining symbol of the civil rights movement, not to mention symbolic of peaceful protests, civil disobedience, and racial justice, in general. To that end, MLK, Jr.'s legacy is often used as an example to make all kinds of points, good and bad. One example of this is Republican presidential candidate and Arkansas Gov. Mike Huckabee using Dr. King's legacy to argue against Black Lives Matter last week on CNN. King's son, Martin Luther King III, defended Black Lives Matter in response to a question he received about Huckabee's comments, in an interview that aired on SiriusXM radio on Friday. "I think Dad would be very proud of young people standing up to promote truth, justice and equality," King said. When I hear people scream, "black lives matter," I think, of course they do. ... But all lives matter. It's not that any life matters more than another. That's the whole message that [Martin Luther King, Jr.] tried to present, and I think he'd be appalled by the notion that we're elevating some lives above others. "I was perplexed by [Huckabee's] comments, but people attempt to use Dad for everything," King said. "I can't imagine how anyone could say that he would be incensed that Black Lives are doing what they are doing. The reality is what Black Lives Matter are raising as an issue is an issue." Indeed, the movement is raising awareness about a very real issue. The fact that Huckabee and so many others still can't even recognize the deep, underlying meaning of the name Black Lives Matter is proof of this. 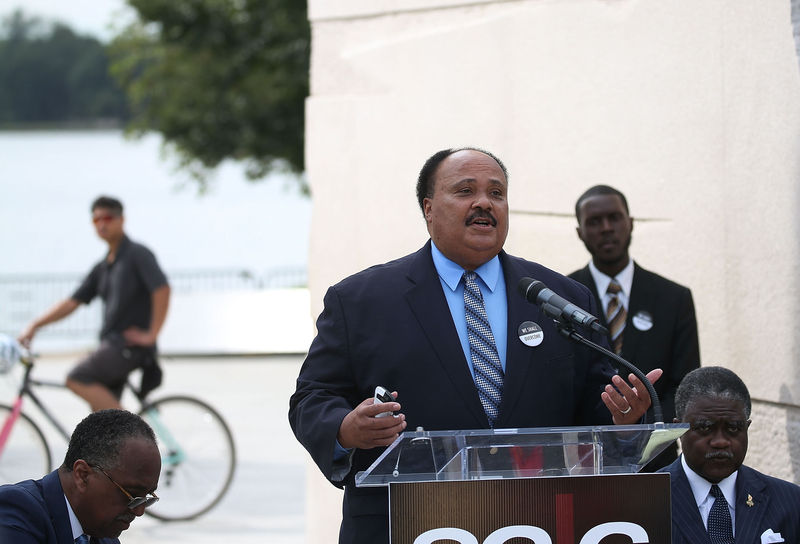 Martin Luther King III has been particularly active in fighting for civil rights this summer, which shouldn't come as a surprise, given that the 50th anniversary of the Voting Rights Act was observed earlier this month. King has led other civil rights leaders to call for presidential candidates to commit to fixing the voting system in America to honor the Act. He has also extended his political activism beyond racial issues to recognize climate change and pollution as destructive to civil rights in an op-ed he published on CNN in August: "[W]e're all entitled to the basic human rights of clean air to breathe, clean water to drink, and healthy land to call home," he wrote. Basically, King's response to presidential candidate Huckabee is just one of several contributions to the political process this summer. Whether it's voting rights, climate change, or, as his most recent comments demonstrate, social justice, it seems King isn't about to just quietly watch events of this election season unfold from the sidelines.